On the bright side, at least there are several cuckoo colored ones to work with. I had also set some eggs from a Dominique male X BBRed Rosecomb females in this batch. They could potentially be useful for working in the Crele variety at some point, but for now it was more like a "hey let's see what will happen!" crossing. 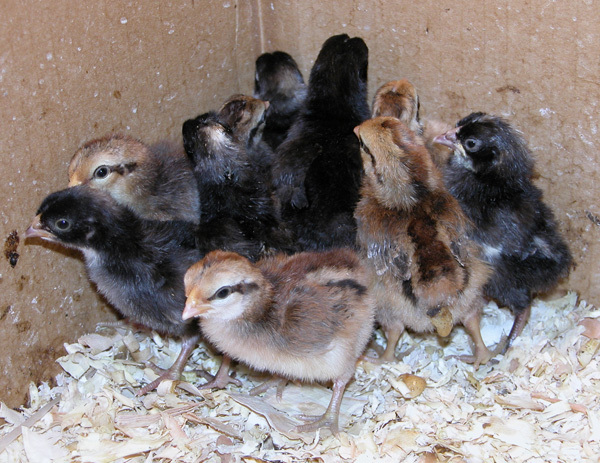 A few of those chicks look like BBReds right now, a few are like dark BBReds (anybody know what color Crele chicks are?? ), and two of them are cuckoo! I find that quite unexpected, but then again I really know very little about cuckoo/barred genetics. I'm quite curious to see which turn out to be males and which will be females. There is one more batch due next weekend, keep your fingers crossed! I am overrun with birds right now. I had to skip the last auction because it was too hot, and I may need to skip it this weekend too. We'll see...it has been warming up a little slower the last few days, so I might still chance it. I really don't enjoy going to auction, but unfortunately there isn't much else to do with the non-show-quality birds. The last time the high temp here was under 100 degrees was in early/mid July. Have I mentioned I hate summer weather?? !